The first time Geocortex Essentials is installed on a computer, it defaults to a 60‑day evaluation period. If you do not activate Essentials within the evaluation period, or arrange an extension, the license will expire and you will not be able to use Essentials. See Essentials Trial Versions for more information. Depending on how many computers Essentials is installed on, you will need one or more activation keys. For information, contact your Account Manager. Essentials must be activated on every server that it is installed on. Once Essentials has been activated on a computer, you do not have to activate it again on that computer, even if you upgrade or install additional instances. None of the information that is sent to Latitude Geographics during activation can be used to identify you or your computer. Before you begin, make sure you have your activation key at hand. If you have multiple instances of Essentials installed, it does not matter which instance of the Post Installer you use to perform the activation—the activation is for the computer, not the Essentials instance. In the Product Activation part of the side panel, click Activate Geocortex Essentials. Enter the activation key in the Activate area. If you have the activation key in a file on your computer, you can either drag and drop the entire key into any one of the subfields, or copy and paste the key into a subfield—the key will populate the subfields correctly. If activation was successful, the license status will appear as Licensed. Activation requires the Post Installer to communicate with the licensing server over the Internet. If activation could not be completed online, an Activation Pending message will display and the Complete Activation Offline area will expand to show instructions for completing the activation offline. 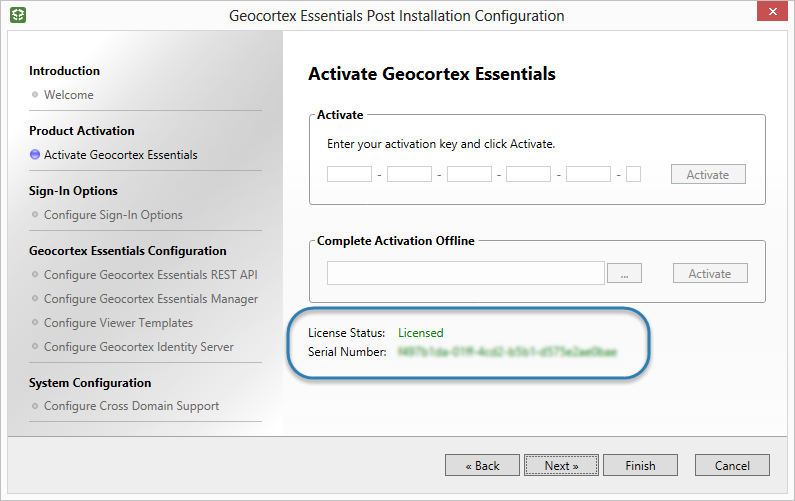 Click the "here" hyperlink in Step 1 of the Complete Activation Offline area and locate the Geocortex Essentials license file. Email the license file to Geocortex Support and request offline activation. Latitude Geographics will activate your license file and email it back to you. Save the file to the computer where Essentials is installed. Launch the Post Installer on the computer you are activating and click Activate Geocortex Essentials. Click the button in the Complete Activation Offline area and browse to the activated license file. The License Status will be "Licensed". You have now completed the activation.